In the letters pages,(‘Letter Hacks’), at the end of this book, Robert Kirkman expresses his, and his teams, satisfaction at this issue. The fact that it has come out a mere fortnight after issue 54 is a cause for celebration – the fact that it is so bloody fantastic and brilliant makes me incredibly happy – all this, and Batman #681 (ie the end of ‘Batman RIP’) to follow…..glorious. A lot of people will be happy with this issue of ‘The Walking Dead’, and it will, no doubt, get great reviews. All fully deserved. Back to the book in hand – what is it that makes this issue so amazing? It is simple – Kirkman is starting to peel off plots and drop them all over the pages, which are again gloriously drawn by Charlie Adlard. If anything, Adlards art looks cleaner and fresher in this issue, and the emotion he manages to portray on these drawings of people is a high point for me issue after issue. In this single issue we got a further exploration of Ricks mental anguish and an insight into his fears. Slowly, I believe, we are seeing our ‘hero’ unravelling. It is a good job there is a new Sheriff in town. None other than the excellent Sgt Abraham Ford, the Warrior / Protector. There is a section where Sgt Ford gets to work out his action-man mojo on some ‘roamers’. He doesnt do a lot else this issue of note, other than a get into a little bit of a debate with Rick. On top of that, you get a new perspective on the undead – a startling new avenue of exploration that neatly dovetails with the arrival of the new characters and specifically Dr Eugene Porter. Alongside that, there is a sense of fatigue and agitation amongst some of the group. Finally, to say that the ending is shocking………I gasped. I never really gasp when reading comics, but this ending – it made me gasp. 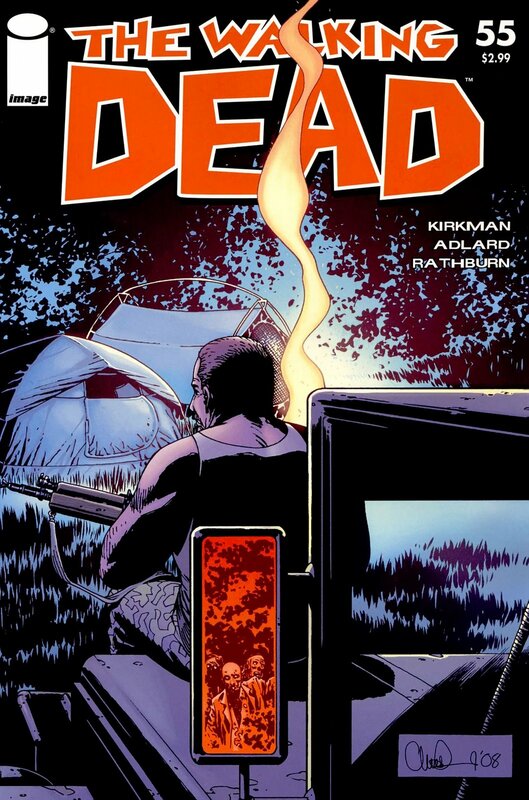 Kirkman, as I have said before, really seems to put a lot of energy into ending the issues on a cliff-hanger. This one is one of the best. Trust me. After the bloody denouement of the prison siege and the relative calm of the following issues, ‘The Walking Dead’ has now begun a trajectory that is near impossible to chart – but it is certainly going upwards and onwards, and it is managing to be exciting and consistent and credible. The shocks and revelations are believable whilst being exciting and they genuinely move the story on. Lets hope (please!) we get one more before the end of the year.